To live out faithfully to the Charism and Motto of the Congregation. Preparing young women to discern and respond to the Divine call to continue His Mission with dedication by means of religious vows. Enabling the hearts and minds of young women for self transformation to get deeply rooted in union with God. 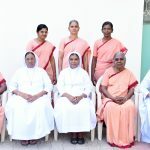 Preparing young women to get detached completely from worldly life to get transformed for fulfilling the purpose of their vocation with strong will and inner freedom. 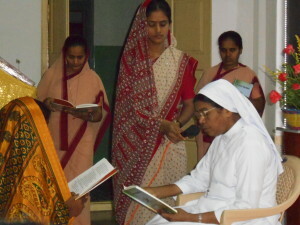 Deepening the spiritual thrust of young women for their conscious and continuous search for God through contemplation on the word of God and from the spiritual sources of the congregation. 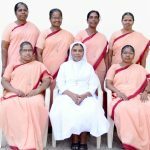 Preparing young women to get detached completely from worldly life to fulfill the purpose of their vocation with strong will and inner freedom. 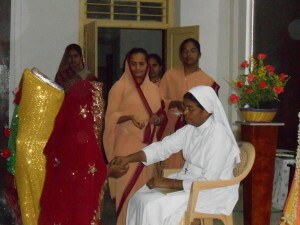 Deepening the spiritual thrust of young women for their conscious and continuous search for God. Enabling the young women to identify and enrich all the gifts of God to become prophets of the world like the Foundress. Guiding and accompanying young women to develop the qualities of openness, simplicity, service minded, compassion, conviction, competence and commitment at every stage of formation.